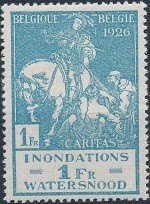 Surtaxed Belgium stamps for the period 1925-1928 were issued to fund various charities. 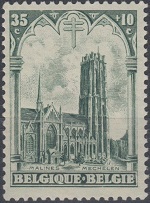 This period also saw the introduction of an annual issue to support the reconstruction of a famous 12th Century monastery, and an annual charity stamp issue featuring famous Belgian landmarks. 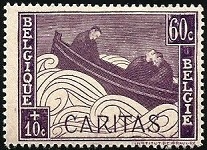 The three Belgium stamps shown above were issued on February 10, 1926 (Scott #B56-59) to raise money to aid the victims of the Meuse Flood. Eastern Belgium experienced heavy snowfall during December of 1925, followed by heavy rains in early 1926. The result was extensive flooding in the Meuse River Valley as it winds through the Walloon Region of Eastern Belgium. The Meuse River floods not only affected Belgium, but also parts of France and the Netherlands, as well. The five charity stamps shown above were issued on December 6, 1926 (Scott #B59-63) to benefit War Veterans with Tuberculosis. 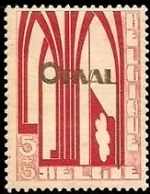 The three lower denomination Belgium stamps, which are typographed, feature the Belgian Heraldic Lion supporting a Shield with the Cross of Lorraine. 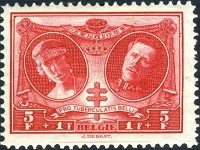 The two higher denomination stamps, which are engraved, feature facing portraits of Queen Elisabeth and King Albert I, separated by the Cross of Lorraine. 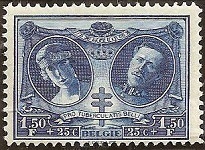 The nine Belgium stamps shown above were issued on September 15, 1928 (Scott #B69-77). 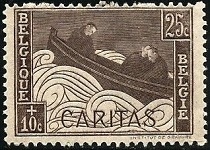 These are the first stamps of an annual series of charity stamp issues intended to provide funds for the Restoration of the Ruined Orval Abbey. Ogives of Orval Abbey. An Ogive is a diagonal arch across a Gothic vault. A monk carving the capital of a column. Countess Matilda recovering her ring. 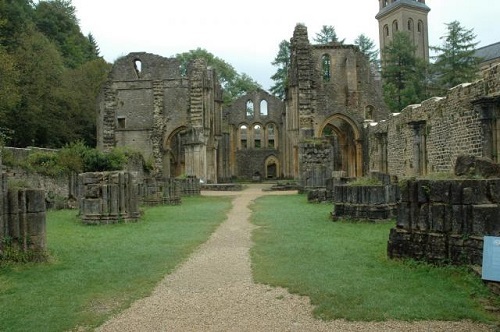 The ruins of Orval Abbey. 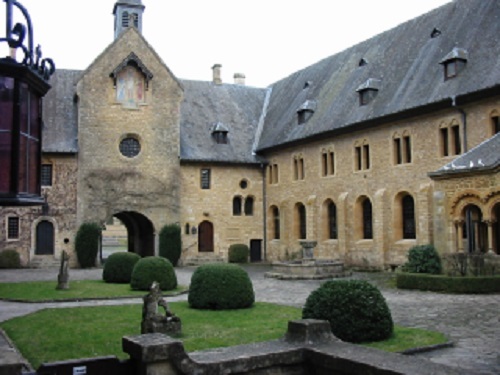 Orval Abbey is a Cistercian monastery, founded in 1132, near Florenville, in the Luxembourg Province of Eastern Belgium. The abbey church was consecrated on September 30, 1124. In 1252, the monastery was destroyed by fire, and the rebuilding took over 100 years. In 1636, during the Thirty Years War, the monastery was pillaged and burnt by French mercenaries. Again, in 1793, during the French Revolution, the monastery was completely destroyed by French forces. After that, the resident community was dispersed, and the monastery was abandoned. In 1887, the land and the monastery was acquired by the Harenne family. In 1926, they gave the lands to the Cistercian Order, so that monastic life could resume on the site. 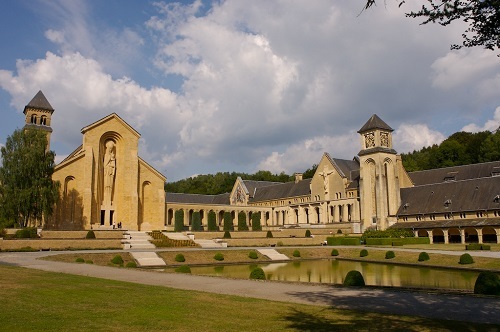 Between 1926 and 1948, a new monastery was constructed, under the direction of Marie-Albert van der Cruyssen, and in 1935, Orval regained the rank of abbey. 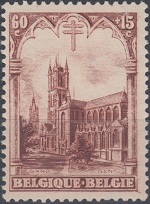 The new abbey church was consecrated on September 8, 1948. The medieval ruins were left on the site, and they are accessible by tourists. 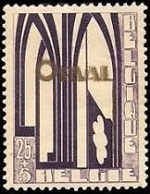 The founding of Orval Abbey and the design of its Coat of Arms is the subject of a legend. According to the legend, the widowed Mathilda of Tuscany was visiting the site, when she lost her cherished wedding ring in a spring. When she prayed for the return of her ring, a trout rose out of the spring, with the ring in its mouth. She exclaimed "Truly this place is a Val d'Or (Golden Spring)", from which the name Orval is derived. To show her appreciation, she donated the funds to build the abbey there. The abbey arms show the trout and ring, and the spring still supplies water to the monastery. The six pictorial charity stamps shown above were issued on December 1, 1928 (Scott #B78-83) to benefit the National Anti-Tuberculosis League. 5 C. + 5 C. - Collegiate Church of St. Waudru in Mons. 20 C. + 15 C. - Cathedral of Notre Dame de Tournai. 35 C. + 10 C. - St. Rumbold's Cathedral in Mechelen. 60 C. + 15 C. - St. Bavo Cathedral in Ghent. 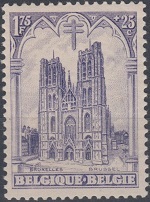 1.75 F. + 25 C. - Cathedral of St. Michel and St. Gudula in Brussels. 5 F. + 5 F. - Louvain Library. Remember that the lots on European eBay sites are usually priced in EUROS. Shipping charges may be more, and the lots may take longer to arrive. Also, make sure the foreign seller ships to your country, before bidding on or buying his lot. 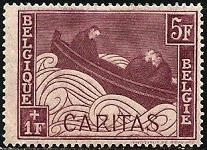 The three charity stamps shown above were issued December 15, 1925 (Scott #B53-55). The surtax was for the National Anti-Tuberculosis League. 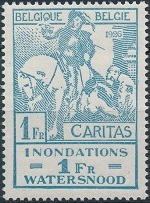 The designs feature a nurse holding a shield with the Cross of Lorraine. In history, the Cross of Lorraine was the symbol of the Crusaders or the Knights Templar. It was also the symbol of the Free French Forces during World War II. In modern times it has been used as the logo of the American Lung Association and various Anti-Tuberculosis organizations. 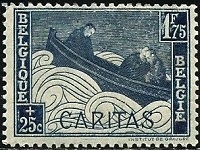 The five charity stamps shown above were issued on December 15, 1927 (Scott #B64-68), with the surtax being divided among several charitable organizations. 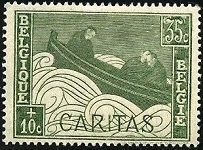 The design depicts a Boat Adrift on a Rough Sea.